This is the first Portuguese edition of The First Eagle, which is the thirteenth Tony Hillerman Navajo Mystery novel featuring Jim Chee of the Navajo Tribal Police and a now retired Joe Leaphorn. This edition was published in 2002 by editorial tágide in Dafundo, Portugal. Tony Hillerman's original text was translated from English to Portuguese by Sandra Amarak. 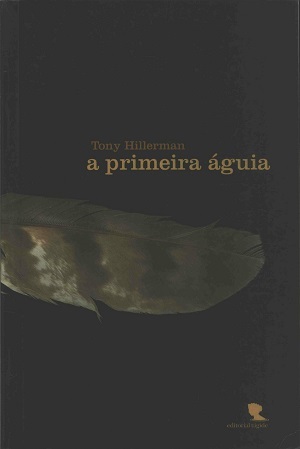 The cover was designed by Frederico Duarte and features the picture of an eagle feather in front of a black background. Format: Paperback, 22.1 x 14.8 cm. Binding: Full-color paper covers with the title, author and publisher's logo printed vertically in yellow on the spine.